This is one from Monday’s four “surprise” book releases that had me VERY excited. So excited, I couldn’t wait until Tuesday’s new release list to post ’em, considering I wanted to read each one equally (and thought you guys might want to, too). And this one gave me a *blurb jolt* ’cause it said he was a cocky, brooding bad boy, and well… truth be told, I was in the mood for exactly that. But then!!! Some of our fellow readers started chiming in about this particular bad boy (and a certain “thing” about him), and OMG I was SOOOOO IN! Gah! I don’t even know if I should tell you “what” it is about him that sold me, ’cause in a way, it’s a surprise in itself. Yep. Had I gone in blind, this reveal or “mini surprise” would have totally snuck up on me and I woulda been thrilled! Maybe even had a little adrenaline rush. I love those! Michelle: I read The Resistance last night and LOVED it…..I hope there will be more to the story….at least another *spoiler* of the *spoiler* like the *spoiler* books….I’m a walking zombie today because I stayed up all night to finish it. Yashira: I loved the angst in the resistance I was so drawn to the story I was yelling at my kindle on many occasions. ( Don’t do it, don’t do it, not the *spoiler*) so I’ve had quite an eventful day. 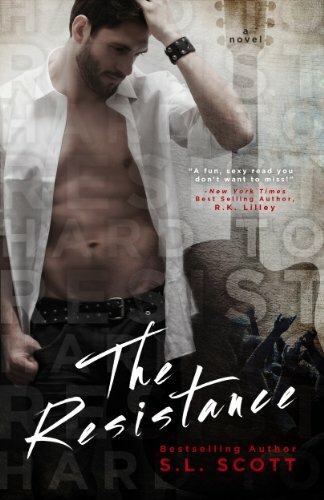 Nikee: I’m also reading The Resistance & I’m LOVING it! Where did this book come from?! I heard nothing about it til the day before it released and it has taken me by surprise! One of the best *spoiler* books I’ve read in a really long time! LOL!! Sorry for that. 😛 I know you’re dying to know what *spoiler* is now, right? Now mind you, it’s really not a big deal if you already “know”, ’cause there are a few other things that’ll happen as the story progresses that’ll punch you right in the gut. Yep. Stuff that you won’t see coming. So…. you know. There’s still plenty to *gasp* about. Plenty to feel. When it comes to bad boys, I’ve always been a sucker when accompanied by a handsome face and sweet gestures. And I have a feeling Jack Dalton is a very bad boy. and decide to “take it up to his room” and well… you know. 😉 Stuff happens. She’s good with it, he is too. Yet while he seems to actually be really interested in getting to know her, she’s hoping for something more along the lines of “what happens in Vegas stays in Vegas”. “This is awkward. Not how I thought it would be at all.,” he says. “We’re adults here. We knew what we were getting into, so no need for awkward.” It’s so awkward. All at once… I’m hit with reality. The girls release my hands as I stumble back, my shoulders hitting the wall behind me. …they end up spending most their Vegas-time together and decide to see where they (as a potential couple) can go from there. And while they conveniently do live in the same state, they lead very different lives, setting them (and us) up for some angsty potential! I liked it! Good writing, and it definitely picked up in pacing and got even better, in terms of the character’s interactions as the book progressed. A little bumpy at first, a bit too much at times for me in terms of their initial “connecting” but they found their groove. Or maybe I did? It had a bit of everything though. That initial exciting attraction, steam (although I found myself skimming those scenes. I guess I was more into continuing their actual story), jealousy issues and misunderstandings (that I relished! ), and a “darkish” past. Plus a few angst-ridden situations, that kept me reading. Mind you, it didn’t emotionally overload me and/or addict me, which I actually like to happen, and therefore I was able to put it down. It was almost a bit “safe” or too safe for me, emotion-wise, although this might be just what many in our reading group would appreciate. But still, a good story with characters that I cared about, a twist or two (or should I say, monkey wrenches?) that kept me guessing and some reveals that gave me a bit of a heartache. 3.5 to 4 stars (mostly 4 stars) <— Four stars for the writing, and enjoyable story, but 3.5 stars because I wasn’t as connected as I’d hoped I’d be. I felt the same way. I wanted to feel it, what other readers say they felt, but I never really did. Same with Phenominal X….couldn’t connect @ ALL (maybe cuz he wasn’t MMA but WWE (? ), the fake, choreographed kinda wresting). BUT, It Ain’t Me Babe by Tillie Cole was EXCELLENT!!! Best I’ve read in a while.